A MBTA train chugging along a track at a railroad crossing. I actually have two pictures of this--one without the train for tomorrow (oops, spoiler alert!). 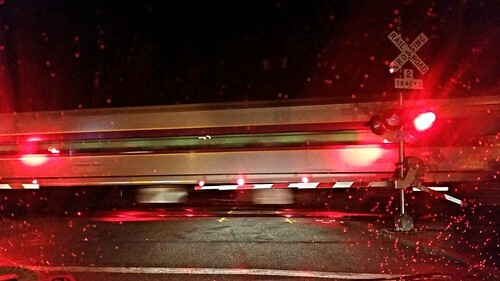 This image of the train in motion--a mere blur to the camera while the everything else pauses on this raining evening. I also like the contrast between the light flashing at me on the right and the light flashing at the train on the left. There's an interesting balance there. One can also see the red light from the other side of the train underneath. The blurriness makes me wonder if there was someone on the train taking a picture of me in my car, would it all be a blur or just those things in the forefront?